Bio Girl: You Should Really Read This Book! So my best friend wrote a book! And you should read this book. Not because she is my best friend, that's why I should read (did read) this book. No no, YOU should read this book because it's amazing! 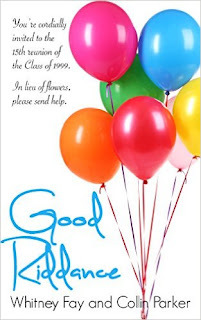 Good Riddance, by Whitney Fay and Collin Parker, is about two best friends suddenly thrown into planning their 15 year high school reunion after their arch nemesis who was planning the event meets her untimely demise. The book's chapters alternate back and forth from 2013 (current day) and 1998, the girls senior year of high school. If you grew up in the late 90's you will love this book. If you have great girl friends, you will love this book. If you enjoy a sweet love story, you will love this book. If you love good books, you will love this book :) It's laugh out loud funny and absolutely worth the $3.99 it costs to buy it on Amazon. The authors, who, you know, are really cool people, have been kind enough to post the first five chapters on the book's website for free. Take a look there, or better yet, just jump on over to Amazon and buy the book! Trust me, you won't want to stop at chapter five.